Bold earrings, check….colorful necklace, check…sparkly bracelet, check…the tallest tiara in the store, check…with the way everyone emphasizes the significance of your Quince, you may be tempted to wear all accessories you can think of to match your gown. But instead of looking your best, you may be blinding your guests with your bling bling. And trust us, not in a positive way! Strapless: You could never go wrong with a necklace! But if you want something different, opt in for chandelier earrings and skip the necklace. Either way, you’ll look like a total doll! You could either choose a meaningful gem such as your birthstone or pick a color that’s on your quince bouquet. Remember to stay away from matching the color of your gown to the color of your accessories, you don’t want to be too match-matchy. For a flirty and timeless look, add a few fresh or silky flowers on your hair. Halter: The best way to accessorize is with your hair! Headbands and crystal hair pins will look stunning. Rule of thumb, if your hair is long or curly, 5-7 pins is perfect. But if you have short hair 2-3 pins is all you need. 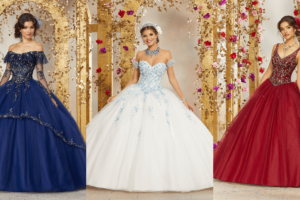 High Neck: The biggest no-no for a high neck quinceanera dress is a necklace! Your neck appears busy as it is with the embellishments and appliques so focus on other areas that need some dazzle. A pair of studs and a gold or silver bracelet should do the trick. V-Neck: Pendants and chokers are your best friends! This neckline begs for a thin chain with a simple pendant or pearls for added elegance. All you need is a necklace to adorn your neckline and a pair of matching earrings. Some metals look better with certain colors. If your dress is ivory, pair it up with gold accessories to bring out the creamy accents of the fabric. For a white dress, silver, platinum, or pearls are your best bet. Pay attention to the bead work of your dress so you can match it perfectly with your accessories. Just as an example, if your dress has pink beading, choose accessories with a pink base. Don’t Forget, Less is More! Before you even step into your favorite accessory boutique and purchase rings, bracelets, necklaces, earrings, and a tiara to wear altogether, choose smartly. At the most, choose three ways to accessorize without overpowering your look. You are totally overdoing it if you plan on accessorizing with huge earrings, a sparkly tiara, and a statement necklace. Instead, pay attention to the embellishments on your dress and the neckline. Simple studs and a necklace can go a long way. Featured image is property of: Melva Moctezuma Photography.